This past week my normal Amazon order contained a programming book. It's not something I was in a rush to get, but my timing of the order allowed that it would be delivered seperate from the rest of the order and should arrive on Saturday. Saturday deliveries are rare, and I'm curious about deliveries and the logistics of Amazon so I looked up who would be delivering the book. 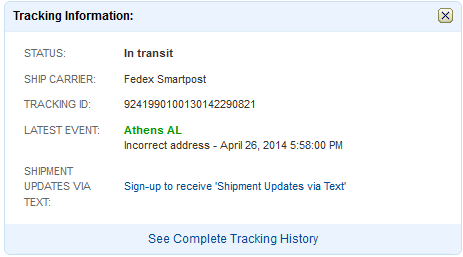 It was marked as "FedEx Smartpost", so that FedEx hands it off to the post office at some point. This should work in my favor, as FedEx packages seldom find their way to my house without ending up at someone else's house first. The USPS mail runs late on Saturday. I honestly think they skip Saturday most of the time. Saturday evening around 7:00 I thought to check the shipping status of my order. Incorrect Address? My address hasn't changed in 15 years. I get almost-weekly orders from Amazon. How could my address suddenly be wrong? I went on to "See Complete Tracking History". Carrier could not locate the delivery address. Ok, that makes a little more sense. My house is hard to find (just ask the FedEx guy). Although I can normally get packages delivered to my front porch by the USPS carrier, maybe the Saturday person doesn't normally follow the route and doesn't know that the gravel drive 10 feet to the right of the 4 mailboxes leads to 3 houses. I can allow for that. I wouldn't try too hard to find a missing house after making stop-and-go trips to mailboxes all day on a Saturday. Just because I was curious, I went on to the USPS tracking webpage to see what they had to say about the details of my parcel's route. Notice Left (No Secure Location Available). Since they couldn't find a house to leave the package at, they left a note in the mailbox to come to the post office and pick it up. 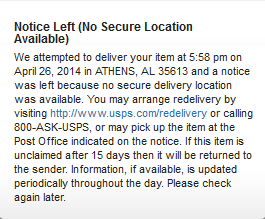 That sounds different than unable to locate delivery address. How would I pick up a note telling me they couldn't find my address if they leave a note at my address? The logic of it all doesn't make sense. I went on to see if there was more information about this last step. Ah, it's not the Amazon definition of not finding an address, it's that they couldn't find anywhere besides the mailbox to leave the package. That makes more sense. I think. At some point I'll venture to the post office and pick up the book. Maybe not, as I've found there's a more recent edition and this may be a way to wait 15 days for the post office to return the package to Amazon without me forking over the shipping fee to return the book. Since it would be my choice to return an item with no defects it would fall upon me to pay shipping fees for an item even though shipping to me is free - I know how Amazon works! In years past I've gotten the latest WWE videogame on the day it's released. It's one of the few games I get my money's worth out of, because I tend to play it until the next version in released. For the past 2 years I've noticed that the WWE game (and the latest Need For Speed for the year) which is released in late October/Early November, will usually get a good Black Friday discount. This year, instead of spending full price on new release day, opted for the Black Friday route. I've been slacking off on my wrestling watching/enjoyment/game playing, so I didn't feel like I was missing much by waiting. One of my bonuses for waiting turned out to be a list at Dealnews that had the Amazon Black Friday lightning deals which showed WWE '13 would be on sale for $25 (regularly $59.99) between 11:10AM and 1:10PM. If you're not familiar with how an Amazon Lightning Deal works, they set aside a finite number of items at a special sale price for a limited time, at which point it's first come-first served. Friday morning was hear and I had the deals page loaded. I had it loaded 3 hours in advance, actually. I watched the timer tick down until the sale started. Suddenly it was taking my browser far to long to switch from the "countdown" to "buy". I reloaded the page and the "buy" button showed up which I promptly clicked. I selected the XBox360 version and the "buy" button turned into a swirling "checking deal" icon. The deal status showed 6% claimed. 61%. Still swirling. The swirling stopped. 100% claimed. You are #2 on the waitlist. This was 1 minute and 12 seconds after the deal started. So I'm on the waitlist. If someone either cancels their order or doesn't complete their order in the next 15 minutes, I've got a chance. I have no idea how I'll know I have a chance. In another browser window I finish another online order, and a couple of minutes later come back to my Amazon window. In the spot that had "100$ claimed" under the videogame, it now says "Add To Your Cart in the next 1 minute 20 seconds". So I did. I hit every button I could until it showed up in my cart. Once it was there, I hit "checkout". I'm still checking my Orders Page to make sure I actually ordered it and everything went through. Lightning Deals are harder on my blood pressure than eBay. Hardest $25 I ever spent, all to save $35. I've got 22 DVDs in various stages of being on the way to the house from Amazon. There are another 10 DVDs on my desk waiting to be entered into the RussFlix database. Can you tell what I was doing during the holiday shopping frenzy? Thanksgiving Day Gina and I went to Florence to see my grandparents. When we arrived, my grandfather wasn't in the living room watching football. Something was amiss. I asked my grandmother where he was, and she told me he was back in the bedroom watching TV, as the TV in the living room died that morning. After 16 years, it finally gave up the ghost. A couple of things went through my head, some with prodding from Gina. The first thing was that my 90 year old grandfather doesn't need to be stuck in the bedroom watching a little TV. I've got a job that will allow me to fix that! Plus, this was the perfect weekend to have to buy a TV. Thursday proper was not the perfect day for it, but still, if you have to ask for good timing you can't get much better than needing to buy a TV at Thanksgiving/Black Friday. 16 years ago, Mom and her 2 sisters went in together to buy that TV for my grandparents. I want to remember it was $100 apiece from the 3 of them to get the TV - a huge, 25 inch, heavy, tube-laden monstrosity that's been sitting on a TV cart for most of those 16 years. I lot of sports ending in "ball" have been watched on that TV. I'm pretty sure $300 of enjoyment was cashed in on that purchase. After Mom's divorce, when it was just me and her (maybe around the 6th grade), our TV died and we made a deal with my grandfather. He was going to get us a new TV and in exchange I was going to mow his grass for the summer. He got us the TV, and I think I might have mowed his grass once. So the way I see it, I owe him a TV. Or a summer full of grass mowing. I think I'm going to opt for the TV to ease my conscience. The new TV should be getting to my house on Tuesday; that was the earliest Amazon's shipping would let me get it, even though I was willing to pay more and make things go faster. I'll hook up the TV at home to make sure everything works, and afterward pack it into the car and take a quick road trip to Florence and hook it up at my grandparents. One of my xmas presents to myself is a new bed frame. I've been sleeping atop the basic metal frame since getting the super comfortable bed years ago. As part of being more grown up it would be nice to have a real headboard/footboard, maybe even something that doesn't slide around the floor a little when I toss and turn throughout the night. As such, I found one I liked on Amazon and promptly ordered it Dec 13th. 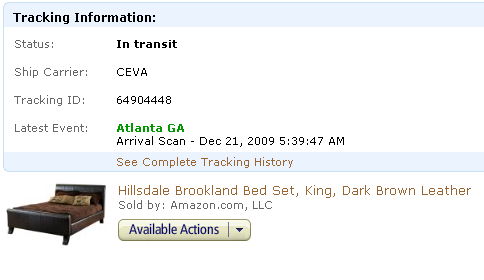 Amazon tracking had the bed scheduled to arrive Dec 23rd, so I would have my new bed frame by Christmas! Or so I thought. The bed was being delivered through CEVA, yet another courier I've never heard of that would have to figure out where I lived. I checked the tracking and everything seemed to be on track come Dec 21st. That was the tracking status Dec 21st. The bed had made it to Atlanta, 3 hours away. Looking up the tracking info on the CEVA site, they actually had it scheduled for delivery Dec 22nd. I expectantly waited for the bed to show up on the 22nd. And 23rd. And 24th. By dinner time on the 24th, when everyone except convenience stores have pretty much closed up shop, I decided to ask Mr Amazon what was going on. I could find no way to contact CEVA in Atlanta outside of signing up to become some type of customer, which in essence I thought I already was since I was waiting on them to deliver my crap! Christmas afternoon I got a nice reply from Mr Amazon telling me (1) Mr Amazon was sorry for the inconvenience, (2) CEVA is a threshold delivery service which will deliver my parcel to my door but I'm responsible for construction, and (3) the number for the Atlanta office is 404-968-1200. That, dear internet reader, is customer service. I got everything I wanted from Mr Amazon. It was about this time that I thought CEVA may have tried to call me, and I wasn't sure what phone number I had on file at Amazon. I went and checked my account and found my old phone number, the one I haven't had in 2 years, was still marked as active. If CEVA had tried to call, they wouldn't have gotten me. Slowly this was all starting to make more sense as to why my bed had been sitting in Atlanta for 4 days. Today I called the number Amazon had sent and got a friendly enough guy in Atlanta. I told him I wanted to check on my package and gave him my tracking number. After about a minute he told me that my package was still on the truck and would be transferred to Birmingham Sunday night. Once it got to Birmingham it would switch to another (local) carrier which would bring it to my house. The local carrier would call me to schedule a time to bring it. I didn't blurt anything out, but it's still on the truck? And it was going to be on the truck for 2 more days before switching to another truck? I thought FedEx had problems when I had ordered my Accounting textbook, but they just delivered to the wrong address. In the midst of all of this, I found out that my old phone number was the listed contact number for my package, so I got Mr Atlanta to update that for me. Now with any luck, I'll get a phone call to schedule delivery for my bed. I'm hoping this is just a late Christmas present and that it's not going to turn into a birthday present as it sits on a truck for another 2 months. I called back Tuesday morning after the status hadn't changed and was quickly put through to an "agent" to schedule my delivery for Wednesday between 12 and 4. At 5:30 the bed got here. Now to see if all the parts made it. I've got a Visa card in which I get reward points like every other point system credit card out there. It's sponsored by Amazon so that I get triple points for Amazon purchases, double points for gas and groceries, and regular points for everything else. I've cashed in points for Amazon gift cards a couple of times. I noticed after my last cash-in a couple of months ago that I was no longer getting points added to my account, so I emailed the friendly customer service folk. no further points were earned on your account. 60,000 point annual limit? Where was this written? It's only September! No, I haven't spent $60,000 in 9 months. When signing up for the card they offered double points for the first 3 months (so at Amazon I was getting 6 points per dollar!) and I wholeheartedly took advantage of that. I also charge my day-to-day purchases and just write a check to the credit card company at the end of the month. But now I've reaches my reward limit for the year and I feel like I'm losing money. Maybe it's time to find a secondary reward that fits my lifestyle?